Winfrey burst into laughter. But an hour later, she took the stage to deliver an incredibly rousing speech that was both personal and a universal call to action. ‘‘I want all the girls watching here and now to know that a new day is on the horizon,’’ she said to thunderous applause. The actress and businesswoman was the first black woman to accept the Cecil B. DeMille Award for lifetime achievement. But would she consider a 2020 presidential run? ‘‘Okaay!’’ she reportedly responded. Have you ever thought that, given the popularity you have - we haven’t broken the glass ceiling yet for women - that you could actually run for president and actually be elected?’’ asked Rubenstein. Honestly, the tweets, the comments - they all could have been fun little jokes. But it’s no longer all that far-fetched to think that someone known primarily for their work on TV and with absolutely no governing experience could not only run for president but also win. And connecting an uber-popular name like ‘‘Oprah’’ with ‘‘presidential campaign’’ is naturally going to generate loads of excitement. (Also, let’s not forget the speculation about ‘‘The Rock 2020″). Then there’s her popularity. A March 2017 Quinnipiac University poll found Winfrey had a 52 percent favorable rating (and just a 23 percent unfavorable rating). She was most popular with Democrats (72 percent) and independents (51 percent). But that doesn’t mean those polled wanted her to throw her hat into the ring; just over one in five said Winfrey should run in 2020, and 69 percent said she shouldn't. Then, in 2004, she heard Barack Obama speak at the Democratic National Convention. Thoroughly impressed, she brought the senator onto her show in 2006. When he ran for president in 2008, she publicly endorsed him. 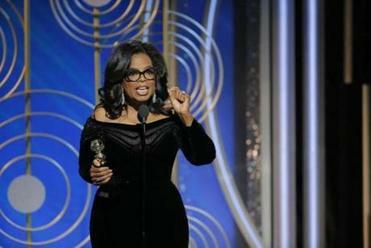 Winfrey - who commanded a viewership of tens of millions of loyal women - for the first time publicly put her formidable stamp of approval on a candidate. Then there’s the time Winfrey interviewed Trump about his presidential hopes - in 1988. And we all see how that turned out. Christina Prignano of the Globe staff contributed.